From Thinking to Feeling | Enjoy Life and Do Good! The remark came from my dirt bike instructor. 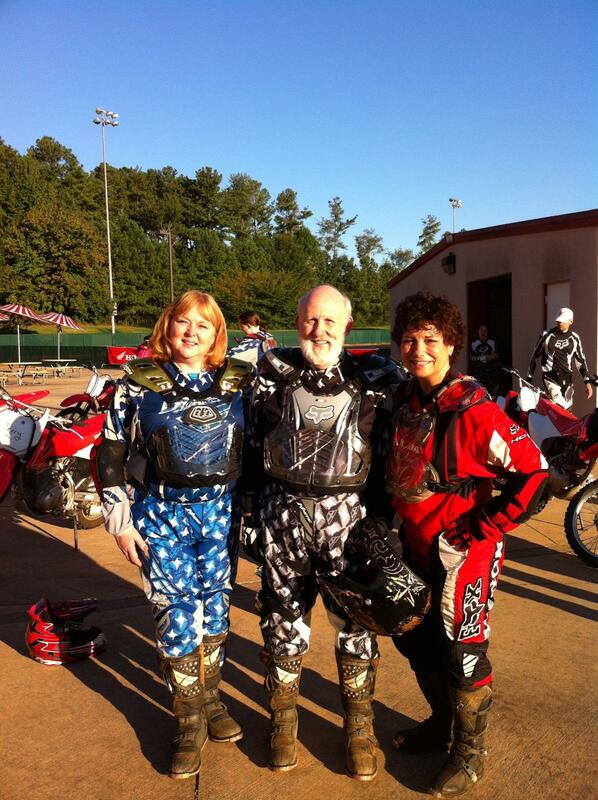 I looked at June Cline, the adventurous friend who was taking the motocross class with me. “Ya, think?” she smirked. “How long you been trying to figure that one out?” Yes, the life lessons we need seem to keep popping up wherever we are, she reminded me. Work, relationships, health, spirituality, finances, even my recreation. I overthink it all. Maybe that’s why I crave adventure. Drew, the young, Italian dirt bike instructor with the intense brown eyes and kind smile told me once again how to release the clutch slowly then gently roll the throttle to give it some gas. This is the same step that tripped me up in the motorcycle class I took about a year ago. That instructor kept yelling at me to, “Stop popping the clutch!” I didn’t know what ‘popping the clutch’ was or how and why I was doing it. I kept struggling. He kept yelling. It didn’t end well. Listening to Drew, I tried again. The bike went dead again. He came over. He put his hand on my forearm, squeezed gently then released slowly showing me the type touch that would work. “You’re releasing slowly to a point then you let go completely,” he said. “Keep the slow control all the way through the release,” he instructed. Slow and controlled. I thought of Tina Turner singing Proud Mary where she says, “You see…we nev-er…ev-er…do nothing nice…and easy…” I thought to myself, “I nev-er…ev-er…do nothing…slow and controlled.” Maybe it’s time to slow down and learn. I took a deep breath and slowly exhaled. I gripped the clutch and hit the starter button. The bike cranked. I gently and slowly opened my left hand releasing the clutch, careful to keep my hand slow and controlled until my fingers were straight. Just before my fingers were completely straight I felt the bike begin to roll forward. I felt it! That was my sign to softly roll back on the throttle with my right hand and give the bike some gas. It moved forward and the motor purred. I was riding! I had gone from thinking through the steps I’d memorized to feeling the bike move. Slow and controlled. Listening to the sound of the motor. From thinking to feeling. In a motorcycle class. Who would’ve thought? Stop thinking, stop analyzing. Just be with the bike. By the end of the class I had weaved the bike between orange cones, ridden in circles and a figure eight and driven across boards and cross ties. In the final exercise of the class I rode up a steep hill, stood on the bike pegs and leaned into the hill while leaning the bike away from me to guide the bike around a small orange cone then back down the hill. Some folks in the class just turned their bikes and rode off the field without trying. Several fell on the hill. Others did well. I did it three times without falling. It was exhilarating! By letting go of overthinking I had been able to feel the bike move. Instead of focusing only on reviewing the memorized steps in my mind, I could listen to the nuances of the sounds the motor makes at different gears. Thinking is good. It just isn’t everything. There are five senses hearing, sight, touch, taste and smell. We may not use them all in each experience. (I can smell the exhaust in the bike class but still want to avoid tasting the dirt!) When we allow ourselves to be fully in the moment we can use all our senses to learn more easily and enjoy the experience more. Every now and then it’s good to do something slow and controlled. And sometimes you just need to hear the motor roar! This entry was posted in Live with Passion and tagged dirt bike, enjoy life, June Cline, Motorcycles, overthinking, senses, Tina Turner by Myra McElhaney. Bookmark the permalink. I have been riding a motorcycle for more then 10 years and I could not say it better. Riding for me is joy defined. Its about the motion involved, the feeling of being in control but knowing that ultimately the road is primarily driver. Its about the smile that is automatically generated when the engine is reved up! Enjoy the ride!